We extend the ideas introduced in Chap. 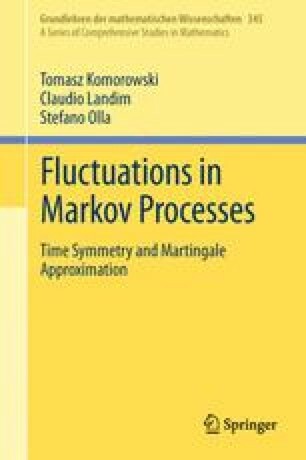 1 to continuous time Markov processes on general state spaces with a stationary ergodic measure allowed to be non-reversible. We first prove a central limit theorem for continuous time ergodic martingales. Then we prove the central limit theorem for functions V such that certain convergence properties of the corresponding resolvent (λ−L)−1 V are satisfied, where L is the generator of the process. We move from reversible processes, where, like in Chap. 1, finiteness of the limit variance imply these convergence conditions, to processes satisfying a sector condition or more generally a graded sector condition. This last condition will be motivated later in Parts II and III by important examples (exclusion processes and diffusions in Gaussian random fields). Normal generators are other examples, that turn out to be important later on for the diffusions in time dependent environments.